Good morning, Nashville. As you may have noticed, it’s been raining. Quite a bit. 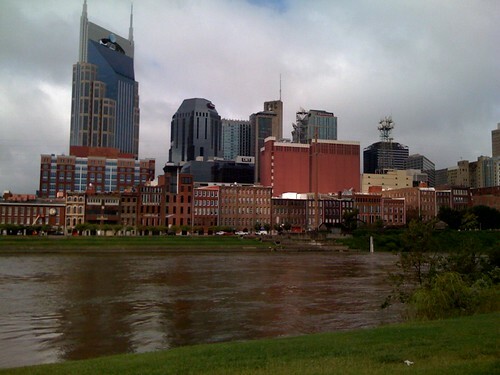 This morning, the National Weather Service issued a flood warning for the Cumberland River. The river is currently at 30 feet and rising, and is expected to crest at near-flood levels, around 40 feet, by midnight before receding in the early hours on Friday. In the meantime, Putnam County seems to have been hit the hardest, though Wilson, Sumner and other surrounding counties saw some significant damage from floodwaters as well. Not so shiny. Another casualty of last night’s rain is the Music City Star track between Lebanon and Mt. Juliet. Parts of the track were washed out by floodwaters, and commuters en route were picked up by MTA busses instead. Zoom zoom zoom. Looks like the Nashville Superspeedway will host two doubleheaders next year in the NASCAR Camping World Truck Series and NASCAR Nationwide Series. This is a big deal for the Superspeedway, as it’s the first time for the track to host more than one doubleheader in a season. Bits & pieces. If you see something that looks like a tornado around North First Street, it’s probably just birds … We wish we had iPads in kindergarten … If you missed Conan’s not-so-secret appearance at Third Man Records this summer, grab the 7″ vinyl instead … Nashville needs a “vibrant urban forest” downtown.